San Francisco Giants 2012 World Series Champions!! If you want to know what I have mainly been doing this Magical October!!! Congratulations San Francisco Giants!! The Giants win the Pennant!! The Giants win the Pennant!! The Giants win the Pennant!! 50 years after losing to the New York Yankees in Game 7 of the 1962 World Series when I was 8 years old, the San Francisco Giants break the 7th Game Curse, beating the St Louis Cardinals tonight 9-0 and Win the 2012 National League Pennant. It took an incredible 6 Elimination Games to do it!! It will go down in baseball history as one of the greatest feats ever. The Agony Kids become the Comeback Kids!!! Good Luck against the Detroit Tigers in the World Series!! Go Giants!! Go Gigantes!! I was googling around the internet for "accessory navicular bone" and happened upon your wonderful website. My husband and I have been dealing with our daughter's chronic ankle pain for 2 years now and I'm ready for a diagnosis already. As a parent, it is extremely frustrating to have doctor's tell you that your child's pain is a) not real b) just a sprain or c) "let's do some PT and see what happens." All of her x-rays have been "normal," and we recently received news that the MRI we were finally granted (AMEN!!) of the ankle was "normal" as well. She cried when we told her everything came back normal. . . The only finding so far is that she has an accessory navicular bone in the ankle that causes her pain. DING DING DING! Wow- once I started looking up information about this little bone, I was floored. The only issue is that I can't seem to find any information about children with this problem. And, we are waiting waiting waiting for an appointment with the foot and ankle specialists at Duke, who are booked from now until February (this email was sent October 20th). In the meantime, I'd love to be able to figure out some way to help her. . . because I KNOW she is in pain. Dr Blake's comment: Pain from an accessory navicular bone normally presents in children around 13-14 at the earliest. The accessory navicular bone is on the arch side (big toe side of the foot) where the powerful posterior tibial tendon attaches, it is the main tendon in supporting the arch of the foot. Very important!! We know that the accessory navicular bone can cause direct pain where it attaches to the normal navicular bone, or cause tendon pain since the extra bone disrupts the normal attachment, weakening the tendon, causing the tendon to strain easier. This is usually an easy diagnosis when the patient points to the accessory navicular and says it hurts right here!!! You got to make it easy for us patients!! However, the pain that your daughter presents with is on the opposite side of the foot and ankle (outside or lateral side). This presentation, along with negative X-rays and MRI, leads me to suspect a mechanical cause of her pain like over pronation (perhaps indirectly caused by the accessory navicular bone. This was sent on my request and X-rays and MRI are on the way. 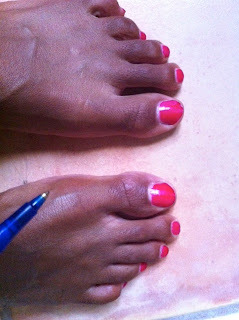 Here the patient clearly notes pain on the lateral side of the foot/ankle. The common diagnoses for the age group is lateral ankle impingement pain, peroneal tendonitis, calcaneal apophysitis, sinus tarsitis, and calcaneocuboid joint sprain. About 2 years ago she was diagnosed with a "tibial growth plate fracture" (suspected since it was never visible on x-ray), and put in a cast for 3 weeks. At that time, pain was located on the medial ankle and in her heel. Following immobilzation, she was fine for exactly 1 year. The pain returned again, only this time it had migrated to the outside of her ankle. Dr Blake's comment: The immobilization had fixed the tibial growth plate fracture. The new pain, one year later, is 99% not related to the original problem, especially since it is in a totally different area. This completed perplexed the orthopedist and he sent us home, assuming that she had either strained it or just liked visiting the doctor on a regular basis. Fast forward through almost a year of soccer games, swim team, summer trips to the water park, and flip flops and we are officially in AGONY. Dr Blake's comment: At least now the picture is getting clearer. 1 year ago she injured herself with a new injury, has had no treatment for that injury, and is not getting better. Since the injury involves no broken bones, bones sticking out of the foot, or torn tendons, the treating doc figured a little time will heal the problem. 95% of the time, it probably does. Your daughter fits into the 5% that really needed more treatment. Since I refuse to go back to the orthopedist who dismissed us, we've been back to the pediatrician's office, had more X-rays (normal), seen an exercise science specialist ("Go back and play soccer. You're fine. I guess we can try PT too. "), seen a sports medicine PT ("Um. . . I don't work with 8 year olds and I'm not sure how to treat a problem without a proper diagnosis. "), and FINALLY we raised enough hell to get her an MRI, which is of course normal. In looking at her ankles, her right ankle is definitely turned in now and the arch is flattened. 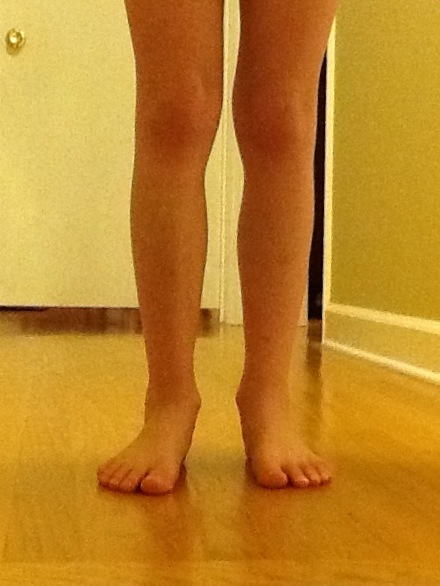 Here is the photo of the back of the legs/feet. Both heels are pronated (ankle bones collapsing in). As the arches collapse, from the back you can see more of the fifth toe. That overpronation is much clearer on this photo with the right side leaning inward. Golden Rule of Foot: When the pain can be from asymmetrical pronation, fix that first and see if the pain is diminished. Is there anything we can do while we wait until February to see the Holy Grail of (adult) ankle specialists at Duke? When your child comes to you everyday in pain, it's heartbreaking. Thanks so much for taking a look at our daughter Dr. Blake. I've attached a few pictures which will hopefully be helpful. In response to your questions, our daughter seems okay in the morning, but then any activity like walking or running seems to result in pain. At this point, just walking around the grocery store seems to be painful. By bedtime she often complains the most and sometimes says that falling asleep is difficult due to the pain. Most nights, she helps herself to an ice pack before going to bed. She also sometimes complains about pain behind her knee after prolonged walking. I am planning to get my hands on X-ray and MRI on Monday and I will send them to you next week. Supination following heel strike is one of the most deadly biomechanical problems. The shoe industry is starting to pay attention with a range of mor stable neutral shoes which will work with orthotic devices to stabilize that problem. However, almost weekly I need to do in-office shoe wedging to eliminate this problem even in the face of good orthotics and shoes. When we strike the ground walking or running, our legs must internally rotate from the feet, ankles, knees, hips and pelvis to absorb the shock. This internal rotation of the entire lower extremity allows the foot to pronate, and the foot to adapt to the ground. If our foot supinates at this time, forcing external rotation of the foot and ankle, problems arise in many ways. The foot can no longer adapt to the ground well and sprains can occur. The shock wave of heel strike will intensify potentially causing bone and joint problems. The peroneals and iliotibial band must work overtime at stabilizing the lateral/outside of the foot/ankle/knee/hip and strains occur. 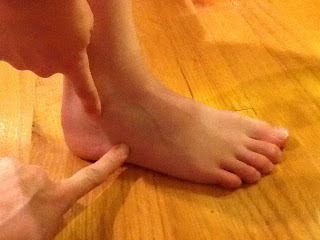 So, when I watch someone walk and run, I look for over-supination at heel strike. I see if simply the shoe needs changing from stability to neutral. I teach the patient how to perform lateral power lacing. 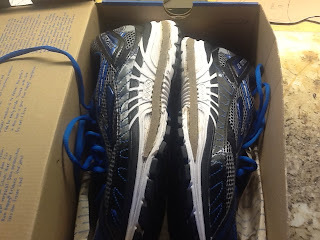 I evaluate any shoe inserts/orthotics to see if I can adjust for anti-supination. 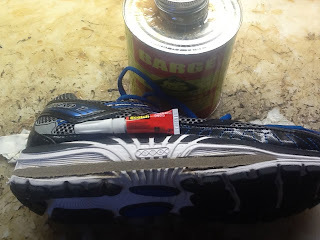 And, I may also wedge their midsole as shown in the photos below to see if this helps eliminate supination at heel strike, and ease their symptoms. Lateral (baby toe side) of the midsole is opened with a scalpel. This process can be easily done by some shoe repair stores. In this case, a 1/4 inch wedge of grinding rubber from JMS Plastics is placed into the opening. 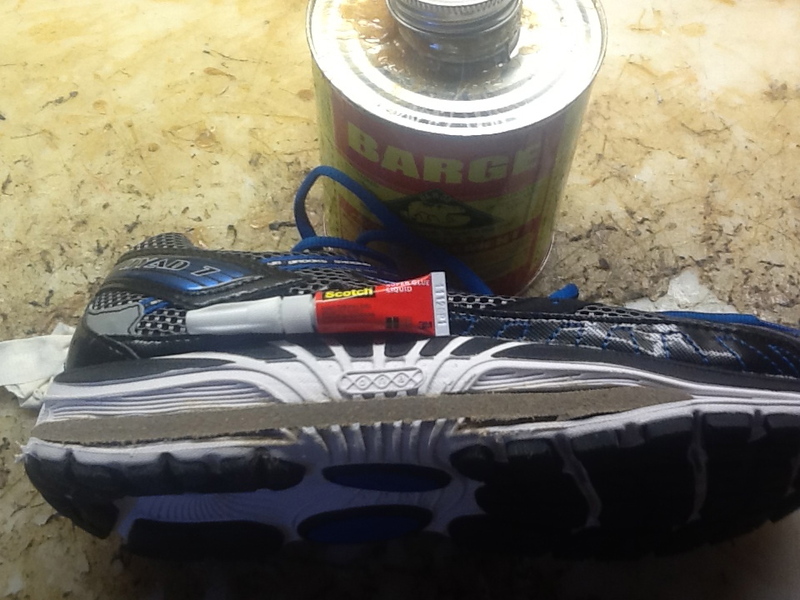 Both sides of the midsole and both sides of the wedge are initially glued with Barge Cement and let to dry for 10 minutes. All excess wedge material is cut and ground off and SuperGlue is used to seal any gaps that did not seal completely. The final product is shown. This patient Vince has chronic medial knee joint compartment disease, and this wedging has allowed him to avoid knee replacement successfully for the last 15 years by eliminating the excessive supination which was causing the medial knee compartment to compress abnormally with every step. So, when evaluating individuals with various injuries, watching them walk and/or run, can give you great clues to treatment. Gait evaluation should be done in most non-acute injuries to see if gait changes may help. This is one example of this process in action. I make my own orthotics for my patients, distance runners struggle to keep their blisters away, the cyclist perfects every part of the bike, the baseball player chooses the right bat, all expressions of the artist at work when success is so fragile. This video is inspiring, and gives us a little glimpse into the pointe shoes of a ballerina. The art, and yet the science revealed, is passed on. One generation to another for the art of ballet must be passed to the next generation successfully. Even though Neurontin (gabapentin the generic name) is commonly used for nerve pain in the foot or ankle, there are some problems with patients getting used to it. These problems can sometimes be avoided if the following gradual increase dosing regimen is utilized. You need to take the evening dose as soon as you finish all tasks requiring manual dexterity (making dinner, driving to the store, etc), preferably by 7 pm. This dosing requires multiple prescriptions of initially 100mg, and then 300mg also. It is preferred to build up the evening dose the fastest. The goal in most patients initially is pain relief down to levels 2 or 1800 mg/day. If you have attained pain levels of 2 consistently before 1800 mg, then you level the patient off at that level for 3 to 4 months, before beginning a slow weaning off (another post). Side-effects occur normally at the start, and taper off as you get acclimated to the drug. The regimen below is listed by week increments, but you can attempt making the changes every 4 or 5 days to speed up the course. There are many variations from here that can be considered based on individual responses to the drug and the response as more drug is added. I've enjoyed reading your blogs. First off I'm curious if you are still in San Francisco. I'm moving to south of France from Bermuda but I'm making a detour stop in San Luis obispo... Maybe I can come by and check you out. Yes I am in San Francisco, and would be happy to see you if you swing through. A good friend of mine is Dr Doug Ritchie in Seal Beach, near San Luis Obispo, and he is very capable also. This video is important for demonstrating both posterior tibial strengthening exercises and the navicular drop test for posterior tibial dysfunction. Hello. I want to express my appreciation in advance for your informative blog and for your dedication in helping so many return to health and activity. My foot problem started about 10 weeks ago. I had pain one morning as I put a sandal on to go to church. One step with my left foot and I noticed a significant pain on the bottom of my foot, below my big toe. Life went along fairly normal that week. I did all my normal activities with some slight discomfort on the bottom of my foot. Six days later (on a Saturday of course!! ) the swelling and redness and warmth of that area started and I went to seek treatment at an urgent care. The NP did not feel an xray would be helpful and diagnosed cellulitis. She did not feel my “pain” was equal to the pain of a gout attack. (of which I have no history of) I began 10 days of Bactrim (for possible infection) and Naproxen for the inflammation( 2- 500mg/day) She encouraged me to follow up with a podiatrist-which I did the following Friday. The podiatrist took an xray- differential dx #1- fractured tibial sesamoid, (xray showed 2 bones-jagged edges) #2- bipartite tibial sesamoid with sesamoiditis, #3- gout I was placed in a walking boot. He told me to go ahead and finish my 10 days of Bactrim and Naproxen. Dr Blake's comment: When you are started on antibiotics, you should normally finish the full 7 to 10 day course, even if you feel better within a day or two. Blood work for my uric acid levels came back well within normal. Dr Blake's comment: Uric Acid is the blood indicator for gout. It always drops into the normal range after a gout attack, so it depends how normal you were to decide if gout is a possibility. At our hospital 8.7 is high normal, so any number in the 7s or 8s still means you could have had a gout attack. After four weeks in a CAM walking boot my foot was worsening. Dr Blake's comment: These removable boots do immobilize the joint by allowing the foot to roll through, but they do not eliminate weight bearing. That has to be done with some sort of padding to float the sore area. Midway through the 4 weeks a felt pad was added to the boot, cutting out a hole for the sesamoid area to help off load the weight. This did not help. The inflammation, pain and redness was increasing. Dr Blake's comment: Remember it is crucial to create a Painfree environment as soon as possible, which could be permanent cast, crutches, RollABout, etc. Whatever it takes to get rid of the pain. I was placed on Indomethacin. However, I had side effects of migraine type headaches and 7 canker sores- so after 6 days he told me to discontinue use. An MRI and another Blood test was ordered. Again blood test for uric acid normal (4.5) MRI report: ”most likely” bipartitie sesamoid with trabecular injury, possibly chronic stress response phenomenon , degenerative changes, and tenosynovitis of the extensor halluces longus tendon. Dr Blake's comment: So, we know you do not have gout. What did you do to possible damage the joint (probably old wear and tear) and the sesamoid (more acute)? With this information the podiatrist decided to place my foot in a non-weight bearing cast for 3 weeks. I was placed on disablitity and returned to the podiatrist office last week. I didn’t need “DPM” behind my name to know my foot did not improve with the cast. The redness had improved, but much swelling still present- more than just from the cast. I was sent home in a post op shoe with crutches and slight weight bearing. I was told if foot was worsening to go back to walking boot and crutches. I am to go back in a week (which is three days from now) for reevaluation and podiatrist will possibly aspirate synovial fluid and/or place a cortisone shot. Orthotics are in my future, but not until more healing has occured. Dr Blake's comment: The course you have been on is logical, as long as changes cause less pain not more pain. Unless you told the doctors more than me, they are looking for a reason to explain this sudden onset of pain, without your physically traumatizing yourself. So, it makes sense to get a synovial fluid analysis, although only get a short acting cortisone shot. You have too much joint irregularities that the joint may break down further under the influence of a long acting shot. Hopefully, even though your pain has been more than normal, all of the rest and immobilization and protection is allowing whatever the source of pain to heal. Do not let the pain increase now that you are out of the non-weight bearing cast. At this point I would say my foot has stabilized. It is not getting worse, and the swelling in the big toe and ball of foot has improved some, but I couldn't begin to wear a normal pair of shoes or walk normally without pain. There is still pain with palpation. Range of motion of the joint is limited and more painful when flexing upward. 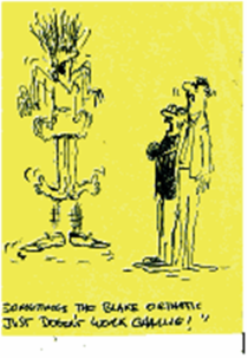 Dr Blake's comment: So, you are behaving like many of my sesamoid fracture patients. It can be something you did 2 days before the onset of pain that caused the crack in the bone. Think back. You have to be treated for the next 2 months very carefully to avoid a flareup, especially when you are apparently healing. Typically, the first 6-10 weeks are rocky, the next 4-8 weeks gradual improvement, and by 6 months after the first MRI you can get another to check overall healing. But, You have to be treated now for a stress fracture unless the other test reveals something. So, I would love to hear what your thoughts are on where I should go from here. I am impressed by your blog and your dedication to help inform others and share your knowledge and expertise. The MRI report used some interesting terminology. I have tried to research online “Chronic Stress Response Phenomenon” and have come up empty. I am not even sure I understand the phrase “tibail sesamoid trabecular injury.” What does that mean exactly? Is the bone fractured inside? I realize my podiatrist is just as frustrated as I am that I have not made much progress. Could you explain to me why my podiatrist may be considering aspriating synovial fluid and/or placing a cortisone shot? Dr Blake's comment: Flattery will get you everywhere!! The MRI shows injury to the bone by showing that the bone is trying to heal. How does anything heal in these temples of ours? They heal by bringing in fluid to the injured area, and with that fluid are the cells and nutrients for healing. That is, if we are eating healthy, etc. So, when the radiologists see swelling within the bone, but no obvious fracture line, they can not call it a fracture for sure, so they call stress reaction, or trabecular injury (the inside architecture of bone), or bone edema. But, they really all mean the same. Get good supportive orthotics made that will protect this area as you wean from the cast, and you can use in the cast as soon as they are made. Three times a day either do a 10 minute ice pack or 20 minutes contrast bath. Learn to spica tape (it takes 10 times or so to get it right. Pat yourselves on the back for ruling out gout, infection, and starting the healing process (however rocky). Consider sending you to a rheumatologist first before injecting the joint if a suspicion of systemic arthritis is being considered. Check out the HOKA running shoes as a possible alternative to the removable cast after 3 months of immobilization is done. Work with your internist of making sure you have the ability to drive Calcium into your bones. Consider a RollABout or A Leg Up for around the house or work if you are constantly irritating the joint. Take this 2 weeks at a time. Avoid anti-inflammatories since they all slow bone healing. Ice is just as good right to the spot. PS-I am 56 with a history of osteoporosis diagnosed two years ago. I am suffering from hallux rigidus since maybe 5 years. I try to use my feet as normal as possible and has experienced that e.g. jogging is not painful and does not make the situation worse. But I am also practicing aikido, a sport when you move a lot from the floor and up. This is more depending on the toes and is difficult to me, both because of stiffness and pain. I try to read about the course of the disease, what to expect. Will the joints eventually be completely stiff and is this good or bad? I really avoid surgery and also wonder what other treatments that can be done e.g. stretching, manipulation etc. I am very happy to respond to you. And, I encourage you to read all the blog posts on this subject to get a good handle on this condition. The problem needs to become a project for you. You need to remain active, but respectful of that joint. It is the most important joint in the foot, if you do not include the ankle. You need to avoid activities that cause pain over a level 2, if you can not adjust to that sport. By adjusting, I mean to change routines, shoes, inserts, taping techniques, padding, etc, in order to play without pain. So, you can jog now, and you must modify akido (unless you are getting paid alot of money, I mean alot of money, to participate through pain!). The condition does progress, but there is no correlation to pain that I can find. I treat 1000's of these, and some minor joint problems cause great disability, and more major joint problems do well. There are so many factors that affect this: shoes, biomechanics, activities participated, where the joint breakdown occurs, pain thresholds, etc. Do not relie on too many generalizations about this, because they are just generalizations. There are way too many aggressive surgeries done. Joint Fusions should be the last resort (at least, after one other surgical attempt). Honor the Big Toe Joint and work on finding out how to minimize pain. The joint will continue to breakdown, and as long as you honor the pain level, you should do as much activity as is possible. All patients with Hallux Limitus/Rigidus need to: learn to spica tape, have custom made orthotic devices to protect the joint, learn to self mob, honor their pain if the symptoms go above 2 with any activity, and use anti-inflammatory measure daily with smoldering daily arthritic pain.